If there are two things in this world that makes me happy to be a gamer, it’s cyberpunk and Rutger Hauer. 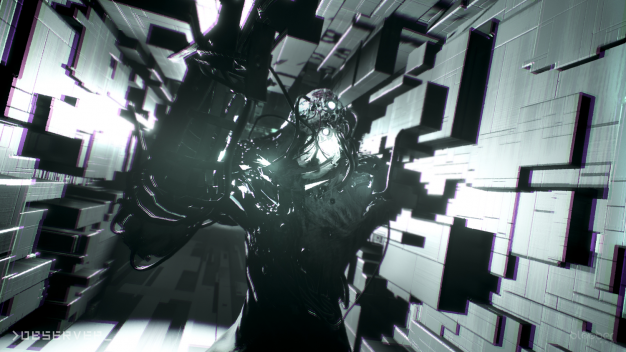 Good thing that Bloober Team game studio has taken these two great things that work great together and created a horror experience that will have you second guessing what you thought was real. 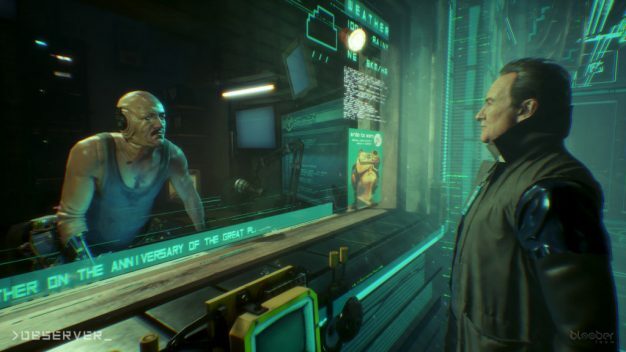 Observer is set in a dark, cyberpunk dystopian future that is suffering the effects of a catastrophic war and an even more destructive plague that has decimated a large portion of the planet’s population. Taking on the role of Detective Daniel Lazarski, an Observer, you are on the front line of neural police work, hacking into the twisted minds of some very disturbed individuals. The world of Observer can be considered as a character in this game just as much as Lazarski or any of his supporting cast. 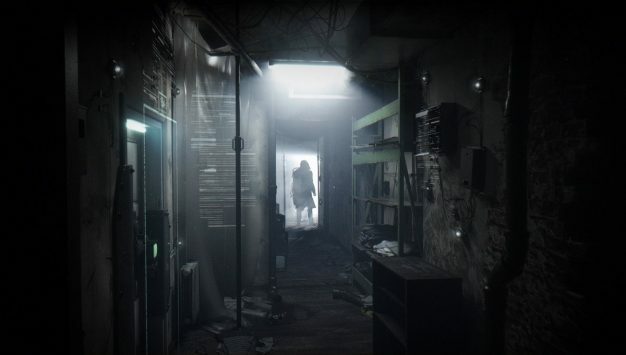 It is a dark and brooding setting where people stay locked in their homes, only interacting with others when they absolutely have no other choice. These people have suffered and are suffering, greatly. Because of man’s mistrust of man, they have developed bio-enhanced technology that allows for the invasion of the human mind. This knowledge has also been used to create neural implants that allow people to escape their realities by linking into virtual worlds. Drug use is also very rampant and a popular method for the denizens of this world to cope. 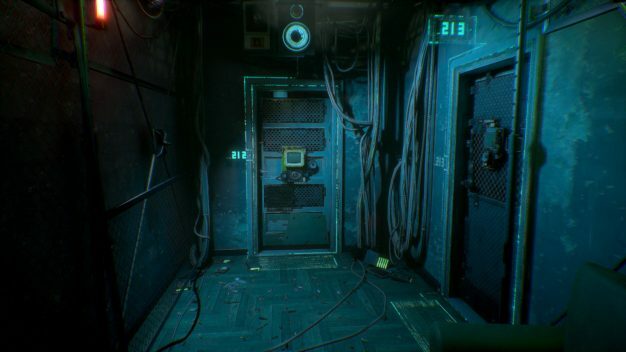 Gameplay in Observer is very straight-forward as you make your way around the apartment building in which the game takes place. You are there because you receive a curious message from your estranged son, a high-level engineer for the almighty Chiron Corporation, so you decide to make your way to the seedy Class C slums of Krakow to investigate. You can walk around, crouch, open/close doors, and make choices about how to proceed in a conversation during the normal interactions in the game. The magic happens, however, during the investigations of the numerous crime scenes that take place. Because of your neural implants, you have to ability to closely examine biological or technical evidence that you find. If worse comes to worse (which it usually does), you can tap into the minds of the victim or the assailant to discover the clues necessary to figure out what happened to your son. The visuals in the game are very smartly crafted and really showcases the dedication of getting the world to feel just right; it shows from the opening scene to the last. Being a cyberpunk thriller, technology is ingrained into every art asset that you see. Even the doors to the apartments of the various occupants are controlled by electronic means. Every inch of the building is covered by surveillance, with highly detailed posters everywhere reminding people of that fact. The walls are crumbling and there is trash strewn everywhere. Every little detail is captured in hi-def to give you the feeling that you are really there. 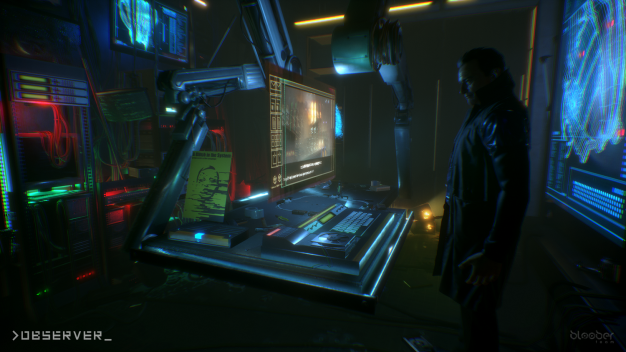 The sound effects and soundtrack are what gives Observer its authentic cyberpunk thriller vibe. Without giving too much away, there are some gnarly jump scares that will have your heart pumping. However, it’s the ambient noises that you will hear as you are making your way through the hallways of the building that will keep you on the edge of your seat. Strange growling noises, dishes crashing to the floor and malfunctioning automatic security doors slamming against their frames makes for a fairly unsettling atmosphere. In addition, the music that accompanies your journey is appropriately haunting at times and amusing at others. The one glaring issue that I had with Observer was the seemingly phoned in performance from Rutger Hauer. If you have ever seen the movies Blade Runner, The Hitcher, or even Surviving the Game, then you know how great of an actor Hauer is. Which makes his voice work here all the more disappointing. While there are some story related reasons (that I don’t want to spoil) why the character of Lazarski speaks and sounds the way that he does, it wasn’t enough to cover the fact that the dialogue and his performance was just not up to par. His typical enthusiastic delivery was just absent and it doesn’t feel that he was inspired at all by the character. Rutger is one of my all-time favorite actors but I was thoroughly disappointed at how uninspired and dry his delivery was. Good cyberpunk thrillers are hard to come by these days but I think that Observer, Hauer’s terrible portrayal notwithstanding, does a great job of capturing the feel of the genre. While CD Projekt RED’s CyberPunk 2077 is still a ways off, if you need a fix, this game will definitely do the trick. While the game takes place predominately in an old slummy apartment building, the locations are varied enough so that it feels like there is a sufficient amount of different environments so you don’t get bored looking at the same sights all of the time. The timing of the scares is spot on and the story withholds just enough of the mystery that you’ll want to keep pulling at threads until the whole thing is unraveled. This game didn’t have a lot of fanfare upon its release, but if you have read this review and it sounds interesting to you, definitely give it a run. You won’t regret it.